The award-winning author presents a provocative, thoroughly modern revisionist biographical history of one of America’s greatest and most influential families—the Roosevelts—exposing heretofore unknown family secrets and detailing complex family rivalries with his signature cinematic flair. Drawing on previously hidden historical documents and interviews with the long-silent “illegitimate” branch of the family, William J. Mann paints an elegant, meticulously researched, and groundbreaking group portrait of this legendary family. 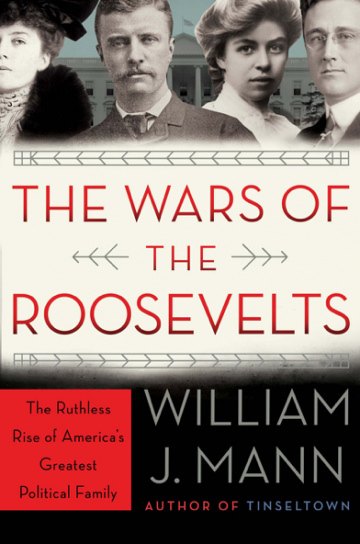 Mann argues that the Roosevelts’ rise to power and prestige was actually driven by a series of intense personal contest that at times devolved into blood sport. His compelling and eye-opening masterwork is the story of a family at war with itself, of social Darwinism at its most ruthless—in which the strong devoured the weak and repudiated the inconvenient. Mann focuses on Eleanor Roosevelt, who, he argues, experienced this brutality firsthand, witnessing her Uncle Theodore cruelly destroy her father, Elliott—his brother and bitter rival—for political expediency. Mann presents a fascinating alternate picture of Eleanor, contending that this “worshipful niece” in fact bore a grudge against TR for the rest of her life, and dares to tell the truth about her intimate relationships without obfuscations, explanations, or labels. Mann also brings into focus Eleanor’s cousins, TR’s children, whose stories propelled the family rivalry but have never before been fully chronicled, as well as her illegitimate half-brother, Elliott Roosevelt Mann, who inherited his family’s ambition and skill without their name and privilege. Growing up in poverty just miles from his wealthy relatives, Elliott Mann embodied the American Dream, rising to middle-class prosperity and enjoying one of the very few happy, long-term marriages in the Roosevelt saga. For the first time, The Wars of the Roosevelts also includes the stories of Elliott’s daughter and grandchildren, and never-before-seen photographs from their archives.